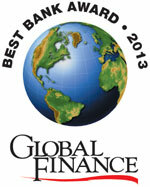 Global Finance unveils its annual list of the best banks globally, regionally and by country. The winners have all demonstrated dedication to satisfying their customers’ needs. Although regulatory issues remain a major concern, bankers worldwide are shifting their focus back to the basic business of banking—meeting their customers’ financial needs in an increasingly competitive marketplace. Winning and keeping clients has become the main priority, and the best banks are stepping up spending on technology and new products to stay on top. “The financial services industry is at an inflection point, still grappling with the barrage of post-crisis regulations, but with priorities shifting to the significant and growing challenge posed by a more demanding, less loyal customer base and by more intense competition,” reads a white paper by financial software company Temenos, in collaboration with Deloitte. The competition is coming not only from within the industry, as the big banks get bigger and enjoy economies of scale, but also from outside the industry. Bankers are increasingly worried about the possibility of their customers going directly to the capital markets for financing. However, the fastest-growing competitive threat, according to Temenos, is coming from payment providers, such as PayPal and Google Wallet. Maintaining profitability in the face of growing regulatory requirements is also a challenge. The US is extending its regulatory reach into global markets. The Internal Revenue Service will require hundreds of thousands of financial firms around the world to register with it (online and in English) by April 2014. Foreign financial institutions that fail to comply with the new Foreign Account Tax Compliance Act will be effectively barred from the US financial markets by a 30% withholding tax. US banks have shown steady improvement in asset quality and earnings over the past three years. In Europe, however, bank profits fell in the second quarter, compared with the first, owing to lower trading revenue and higher non-operating charges, according to analysts at Barclays. Asset quality is deteriorating on the periphery of Europe, but the capital ratios of the banks continue to improve. 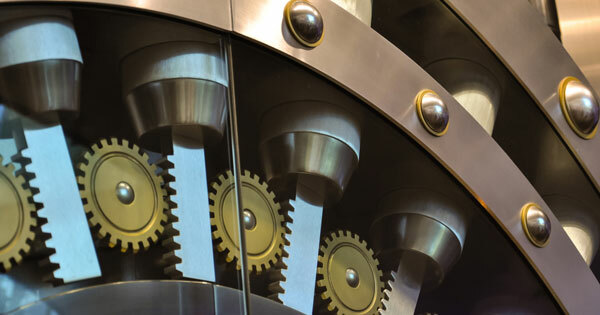 Large European banks are preparing for an upcoming asset quality review in the first half of 2014, ahead of the European Central Bank’s becoming the single supervisor. Emerging markets offer an attractive prospect for financial institutions looking to increase their revenues. However, the excitement surrounding rapid-growth markets is tempered by political instability, economic volatility and undeveloped market infrastructure, Ernst & Young says in a recent report. Many emerging-markets banks are not well equipped to help clients access capital markets, it says. This could give international banks an opportunity to poach the most-profitable customers of domestic banks. In our 20th annual survey, Global Finance has identified the best banks in 136 countries and eight regions of the world. 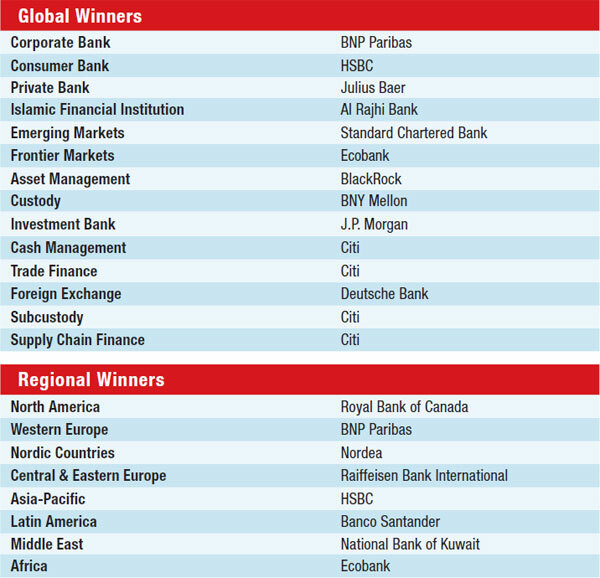 We also have selected the best global banks in 14 service categories. The winners are not always the biggest banks but rather the best banks—those with the qualities corporations should look for when choosing a bank. These are banks with the most-effective risk management systems, the best products and the best customer service. Winners were selected based on performance over the past year and other subjective criteria, including reputation and management excellence. Global Finance made the selections after extensive consultations with bankers, corporate financial executives and analysts throughout the world. 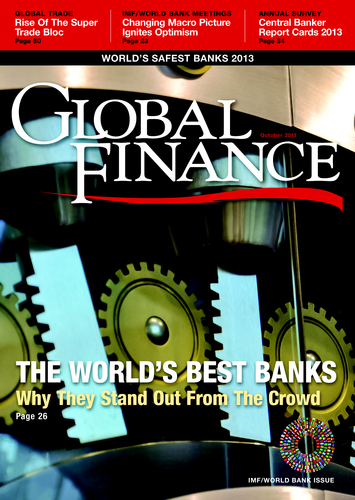 The winner of Best Bank for Foreign Exchange was announced in the January 2013 issue, Best Bank for Cash Management was announced in the March 2013 issue, Best Investment Bank was announced in the April 2013 issue, and the Best Bank for Supply Chain Finance was announced in the July-August 2013 issue. BNP Paribas has successfully adjusted to the new regulatory environment, following an adaptation program begun in 2011. During the second quarter of 2013, the newly integrated corporate and investment bank maintained its number-one position for all corporate bonds in euros. The bank posted a rise in transaction volumes and had a strong performance in structured products, particularly in Europe and Asia. It was the leading bookrunner in Europe by number of transactions in equity-linked issues in the second quarter. Corporate banking fees rose 22% compared with those of the second quarter of 2012. BNP Paribas was the leading bookrunner in syndicated financing in Europe in the second quarter. HSBC is continuing to adjust its business to focus on areas where it is strong and has a competitive advantage. Its net income in the first half of 2013 rose 22% to $10.28 billion. The bank did particularly well in its two biggest markets, the UK and Hong Kong. CEO Stuart Gulliver has closed or sold 54 businesses since he took office in 2011. HSBC remains the largest locally incorporated foreign bank in many of the markets in the 80 countries where it operates. Its retail banking and wealth management business is now offering Premier products and access to HSBC’s global markets intelligence. The bank is the market leader for renminbi business and is well positioned in many emerging markets. Swiss private bank Julius Baer’s earnings rose 26% in the first half of 2013, excluding one-time charges to integrate Merrill Lynch’s international wealth-management business (which was acquired last year) and a tax settlement. The results, which beat analysts’ estimates, reflected increased client trading volumes, including foreign exchange. Julius Baer is one of at least a dozen Swiss banks under investigation by the US on tax-evasion allegations. The Merrill Lynch businesses outside the US, particularly those in Asia, could help Julius Baer to stabilize its operations as European and American clients pull money from Swiss bank accounts amid a growing crackdown on offshore tax evasion, according to honorary chairman Raymond Baer. Al Rajhi Bank is the largest Islamic bank globally and boasts the largest branch network in Saudi Arabia, according to Fitch Ratings. In December 2012, Fitch affirmed Al Rajhi’s ‘a’ viability rating, representing a high fundamental credit quality. The rating was based on the bank’s strong profitability (a return on average equity of 23.7% in the first nine months of 2012), healthy asset quality and substantial retail-deposit base. Al Rajhi earned 7.9 billion Saudi riyals ($2.1 billion) in 2012, an increase of 7% on 2011 levels. Customer deposits increased by 24% to reach 221 billion riyals. In addition to its extensive network of 488 branches in the Saudi kingdom, Al Rajhi has 24 branches in Malaysia, a branch in Kuwait and three in Jordan. UK-listed Standard Chartered makes more than 90% of its profit in Asia, Africa and the Middle East. Its earnings fell 24% in the first half of 2013, owing to a slowdown in Asia’s economic growth and a $1 billion write-down at its South Korean business. CEO Peter Sands says improving growth at the bank’s Indian and African operations is helping to offset the slowdown in Asia. “These economies do not all rise and fall simultaneously,” he says. The slowdown in China reflects efforts to rebalance its economy toward domestic growth, and this will yield improvements in the long run, Sands says. In South Korea a new government program allows consumers to restructure their debts and forces banks to take big write-offs. Pan-African Ecobank, based in Lomé, Togo, is the winner of Global Finance’s first-ever Best Frontier Markets Bank award. Ecobank is bringing mobile-banking services to unbanked frontier markets. Its earnings doubled in the first half of this year to $169 million, thanks in part to growth in Nigeria and Ghana. Revenue climbed 24% in the first half to $947 million. Thierry Tanoh, group CEO, says: “We have seen a little more recovery from Mali and Cote d’Ivoire, and Senegal is starting to pick up post elections. Central Africa is also growing.” The IMF forecasts economic growth of 5.4% in 2013 and 5.7% in 2014 for the economies of sub-Saharan Africa. BlackRock, the world’s largest money manager, posted record earnings and revenues in the second quarter of 2013, despite rising interest rates and bond market losses in May, when the Federal Reserve hinted it could begin tapering bond purchases. “We expect to see flows moving into more-flexible, nontraditional fixed-income products,” CEO Laurence Fink said in a call with investors. “We are seeing more and more interest in multi-asset products.” New York–based BlackRock’s second-quarter profit rose 32% to $729 million. It ended the quarter with $3.9 trillion of assets under management. BNY Mellon, the world’s largest custody bank, had assets under custody and/or administration of $26.2 trillion as of June 30, 2013, an increase of 4% from a year earlier. The increase reflects higher equity-market values as well as new business. BNY Mellon’s second-quarter earnings rose 78% to $833 million on record revenues. Gerald Hassell, chairman, CEO and president, says: “Our solid revenue growth is a reflection of better market conditions in the quarter, as well as our success in collaborating across the company to deliver solutions our clients need.” In May, BNY Mellon and its Pershing Advisor Solutions subsidiary combined their bank and brokerage custody into a single offering. In a year of transition from survival to recovery, J.P. Morgan grew market share across the board thanks to a loyal client base, a long-term strategy to embrace regulatory reform, a strong corporate lending legacy and the integration of equity underwriting talent from the acquisition of Bear Stearns in 2008. J.P. Morgan raised more money in bonds than any other bank in the world—$465 billion for its clients in 2,164 deals, according to Dealogic. And it raked in $5.6 billion in investment banking fees last year—more than any other bank, according to Thomson Reuters. Citi’s global footprint enables it to capitalize on trends in globalization and shifting trade flows. John Ahearn, managing director and global head of trade, says: “Between 80% and 85% of world trade is still financed in dollars. We have been able to take market share and launch some innovative products.” The bank is the largest service provider for private-labeled letters of credit and open-account transactions. Citi has partnerships with more than 60 export credit agencies worldwide, and has long-term relationships with multilateral finance institutions. Last year Citi opened a Latin American trade desk in Shanghai to support increasing trade flows between Asia and Latin America. Deutsche Bank increased its market-leading FX volume in the past year, while reducing its value-at-risk and headcount. Crucial to this development has been its investment in technology, exemplified by its Autobahn 2.0 trading platform. The bank’s decision to maintain a full-strength FX structuring team has also helped, with growing demand for its strategy and hedging products despite the lack of volatility in the FX market. Deutsche Bank’s push into Asia, and in particular China, has also paid off. Citi has the largest proprietary custody network in the world, covering 61 markets. In April 2013, Citi announced plans to acquire ING’s custody and securities services business in seven Central and Eastern European markets, including Russia. Lee Waite, global head of direct custody and clearing at Citi, says: “All financial institutions are in a position where they need to really be critical and to think about what businesses they are in and whether to exit certain businesses altogether. ING decided that providing direct custody services in these CEE markets was not a core business for them, going forward.” Further consolidation in the industry is likely, he adds, because cost pressures continue unabated, interest rates are low, and securities lending is muted. Some of the main prerequisites for a bank to be able to support supply-chain finance programs in different countries are its knowledge of local market regulations and laws, a strong balance sheet and a presence on the ground in as many key markets as possible. Citi certainly meets the criteria, with branches in more than 100 countries globally, including most of the major trade corridors. Its supply-chain finance offering encompasses a range of solutions covering different aspects of the supply chain from procure-to-pay to receivables financing, distribution finance and supplier finance. It has carved a niche for itself in working closely with export credit agencies and multilateral finance institutions, notably the US Ex-Im Bank and the IFC, to supply financing to US SMEs and in emerging markets. France’s biggest banks were undercapitalized and overexposed to Southern Europe when the financial crisis struck. Market leader BNP Paribas has gone farthest in righting that position, reducing its risk-weighted assets by a further €62 billion ($80 billion) in 2012. Its cost of risk fell dramatically while liquidity buffers improved more than twofold, compared with those of the previous year-end. CEO Jean-Laurent Bonnafé observed that in a challenging environment for the entire banking industry, BNP Paribas succeeded in maintaining its client franchise, profitability and strong risk-management culture, while adapting the organization to changing market conditions and regulation. Looking ahead, BNP Paribas plans to expand its presence in Asia. Santander continues to deal with challenges from the eurozone debt crisis, but it remained in the black despite a 58.8% year-on-year drop in net attributable profit in 2012. Latin American banking operations were mixed but encouraging; though profits declined in Brazil and Chile, they rose 16.1% and 6.2%, respectively, in Argentina and Mexico (in local currency). Amid the storm, the bank listed shares of Santander Mexico, with demand coming in at five times the supply, making it the world’s third-largest deal of its kind in 2012. The bank kept its branch network in the region nearly unchanged at 6,044 branches, and total employees were down only 1.5% to 90,576. As a global bank, HSBC is facing challenging times—with regulatory fines, negative media attention and heavy losses in European markets. Behind the headlines, however, the bank’s commercial division had a record-breaking year in 2012, led by its performance in Asia. The commercial division posted a record profit of $8.5 billion, up 7.5% from 2011. Overall net profit for 2012 dropped 6% to $20.6 billion, with the bank taking a $5.2 billion hit after revaluing its own debt. Of that profit, however, $18 billion came from Asia, up 36% from the previous year. HSBC has cut costs and streamlined operations in recent years, selling off or closing more than 47 businesses or noncore investments since the beginning of 2011.